These websites is only a small part of the deceptive tactics used by Antispyware Soft in order to create the appearance of infecting your computer and thus force you to buy its full version. Antispyware Soft is a fake antispyware program, which looks like a real antispyware application, but in reality is unable to detect or remove any viruses and trojans nor will be protect your computer from legitimate future infections. 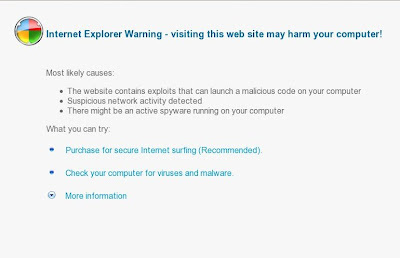 If you find that your computer is infected with this malware and your browser is redirected to antispy-tool.net or antispy-tool.com, then most important do not purchase anything here. Ignore all that these sites gives you. Use the step by step Antispyware Soft removal guide or the instructions below to remove it from your system for free. Download HijackThis from here, but before saving, in the Save dialog, rename HijackThis.exe to iexplore.exe and save it to your desktop. Make sure your Internet Explorer (or any other browser) is closed when you click Fix Checked! Close HijackThis. Download Malwarebytes Anti-malware. Double click mbam-setup.exe to install the application. When installation is complete, make sure a checkmark is placed next to Update Malwarebytes' Anti-Malware and Launch Malwarebytes' Anti-Malware, then click Finish. If an update is found, it will download and install the latest version. Once the program has loaded you will see a screen like below. Select "Perform Quick Scan", then click Scan. When the scan is done, click OK, then Show Results to view the results. You will see a list of malware that Malwarebytes' Anti-Malware found on your computer. Note: list of malware may be different than what is shown in the screen below. Make sure that everything is checked, and click Remove Selected. Once disinfection is finished, a log will open in Notepad and you may be prompted to Restart. Note 1: if you can`t download these suggested programs above, you need uncheck "Use a proxy server" option by doing: Run Internet Explorer, open Tools menu, select Internet Options. Open Connections Tab and click to Lan Settings button. Uncheck “Use a proxy server” box. Click OK. Click Apply. Click OK. Note 2: if you can`t run these suggested program above, boot your computer in Safe mode with networking and repeat the above steps once again.